We’ve received a lot of great feedback and testimonials from our clients over the past years. We are proud to showcase some of it below! Both crews that came out were very hard working, and friendly. They made sure to have us come out and check the progress at a few different checkpoints to make sure we were happy. We are extremely pleased with the end results! The fella came to size up the job sent a quote promptly and the workers completed the fence in 2 working days the workmanship was very good and i have no qualms with it. All we had to do was wait for the ground to soften up and the ice and rain to leave! We were in a hurry to have the job done and they were very accomodating! Finished on time ! Am so pleased with the beautiful fence that was installed by Jay Fencing Ltd. I took the time to obtain 4 estimates, that was provided by the Better Business Bureau. Dave Dey of Jay Fencing was the only estimator that gave the correct length of fence needed and stayed true to the cost given. Dave was professional and very pleasant to work with. I was so impressed with the men who installed the posts and a few days later the boards. Very focused and hard working. Due to the brush and trees that grew on the next door’s property, this needed clearing and again, the workers worked as a team and got the job done. Any further fencing and deck work that is needed, I will definitely employ Jay Fencing Ltd. I want to thank the Jay Fencing team for doing a fantastic job installing my new PVC porch floor. It was by accident that I learned that Jay Fencing does decks and now porches too. You might want to consider changing the name 🙂 Firstly I want to thank Kelly who was always there to answer my emails and questions about the details of the project and provide me with a very fair price. Shockingly other companies were quoting at 3 times what it should cost. I was in no hurry to get it started but once it was, wanted it done in a timely fashion. Two and a half days later it was. I knew the product I wanted installed, so it took me some time to find a company that I felt was qualified to install it properly. I want this to be my forever porch. Right from day one when I met Joe the installer, I saw the lengths he was going to to do the job right. I knew I had the right guy for the job. I felt at ease that I didn’t have to be there every step of the way. I told him about my concerns and he addressed every one. So thanks again everyone! Jay Fencing did a fantastic job on our new fence, it was built with quality products, completed on time and on budget. They are extremely professional and courteous while on site and this was our third project with them. Thank you again! We are very impressed with the quality and service that we have received from Jay Fencing with the installation of a 6 foot fence across the back of our yard. The structured schedule that was outlined for us for the installation was spot on, even with the different weather conditions. The installers that came to the house were very nice people, they were hard workers and did an excellent job. I highly recommend this company; and when the time comes to replace the fences at the sides of our property – guess who we will be calling! Thank you. We just had a short fence as well as a fence repair completed by Jay Fencing. Let me say from the time of the initial quote to the completion of the fence and repair, we have been nothing but happy and completely satisfied! The price quoted was right on if not better than others quoted, the work was completed as soon as the locates were done, the installers were just amazing and went out of their way to make us happy and the final price was no higher at all than what we were quoted. We would use Jay Fencing again in a heartbeat and would highly recommend them. Thanks so much for the great work! After our fence was blown over in winds on Sunday, I called Jay Fencing on Monday. I was impressed that Kelly was able to see us that day. We had great advice, posts in by Thursday and a completed fence by Saturday. It looks fantastic and in timely fashion as well. I’m sure the neighbours appreciate it too. 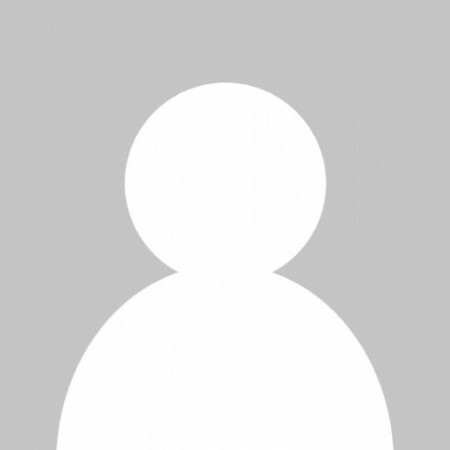 The workmanship is great and the service was top notch. I don’t say that often these days. Jay Fencing earned it! Thank you. We can’t say enough about Jay Fencing. Everyone, and I mean everyone that we have been in touch with, has been absolutely wonderful. We are so excited to have our deck completed this fall and will look forward to next spring and summer to enjoy it! Thank you to everyone at Jay Fencing. You are an amazing company and we will highly recommend you to anyone. We had Jay Fencing install an ornamental steel fence on the street sides of our corner lot in Harriston. The people in the office had the local bylaws in hand, and we planned the fence with their help. The crew showed up on time with everything they needed (we’re 45 minutes from the shop) greeted us and got to work. They worked steadily, got the posts in, and even installed two gate arbors for us. A few days later, they returned to attach the panels; the work was quickly finished, and the compliments have been coming in ever since. The fence suits our home, and the workmanship is topnotch. Thanks! I just wanted to write you a quick thank you for everything. I appreciate all of your help in this process and will definitely contact you again when I am ready to replace the other part of my fence. The fence looks great and we have had so many good comments about it from the neighbors. I want to also let you know that all of your guys that were on site were professional and the work they did was top notch. I just wanted to tell you what a great job was done today by the two gentlemen who finished the installation of my fence. The fence looks great and the cleanup job was superb. They worked very hard and were most professional. Thank you. Just a note to let you know that the fence looks great. Your crews were very professional and left everything clean and tidy. Thanks again for getting the fence completed on the weekend it is very much appreciated. We saw the fence yesterday night. Wow!! It is gorgeous!! We really love it !! Thanks to you and your guys who worked on it. They did a great job. They cleaned the ground, etc. everything looks perfect! Just happened to drop by and they’re doing a wonderful job….trimmed both new gates AND volunteered to adjust front gate before they leave….thanks ever so much! We really love the job the guys did …great company to deal with! Thanks, Kelly. The dogs are loving their backyard, chasing each other with speed and agility that is a pleasure to behold. Thank you, for making the time to accommodate Emmett. I realize this project was a little frustrating as we couldn’t finish everything at once. I just wanted you to know how much your service has been appreciated. Right from day one when I called you to basically drop everything and come and measure the back step for Helmutz, when we hadn’t even started to work together until now, you have always been there. I have had a couple of comments from some of the people inquiring about my fence indicating that they had thought you were a little pricy. One of them was one of my clients. I promptly advised her that you get what you pay for. The cheapest (from my experience) is NEVER the best option. She agreed when I explained to her the quality that has gone into the workmanship. Please ensure that the entire team know how much they are appreciated, including the ones that worked on the deck. This was also the reason that I chose Precision, because I recognized their attention to detail. The City dropped by yesterday (Warren) just to see how things were going. He and I have been exchanging construction stories as he is currently in the process of building his own home. He absolutely loves what is taking place. He says he has been watching the progression for years and has taken a personal interest. FYI plans are already in the works for a pool party in the spring. I truly hope you and your team can attend. I will keep you informed . The guys that came out (I don’t know their names) but they did a great job, it is a bit of an irregular property but it is better than we expected. They were also very courteous and helpful. They asked for our input before continuing with some of the installation. They cleaned up the property before leaving, looked like they were never there. We are happy with this job from start to finish, yourself, Horatiu and now the installers, just very happy with the service, great team. Just reporting in — Spencer and Kevin did an outstanding job today getting them fence posts installed. They were so conscientious that they even stopped for a (partial) legal review! Spencer and Kevin repeatedly assured me that the posts were within the property line, which I appreciated very much. These guys work their hearts out. You are lucky to have such good employees — on time; trustworthy; professional; and more than capable of handling the public. Please put this recommendation in their employee files, if you would. Salah & Chris were here today and completed the install. they just stuck to their job, and got it done. Excellent! You and your family must have a very good business, to attract talent like you obviously have. Thank you very much for everything: brings me “Peace of Mind”, actually. And, I can’t tell you enough how happy I am with your employees — they literally gave me “peace of mind” — they all made a potentially difficult situation very easy, actually. We had a lovely vacation and were happy to see Jay fence busy at work when we woke up Wednesday morning. Your crew did a great job. I’m glad you stopped by to see it. We are so happy to have our yard back. As you know it’s been in the works all summer. Thank you for all your help Horatiu. It was a pleasure to work with you as well. We will be in touch when we are ready to put a pool in and need to finish the fencing around the yard. My gates were installed yesterday. Thank you everything looks great. I wanted to let you know that this was a very professional experience by your team. Our family felt comfortable and at ease from start to finish. We absolutely love the fence. It looks fantastic and our neighbours were so impressed with the work that was completed. Our dog is loving the backyard. We think he believes that he is at a cottage and not his own backyard. Lol. Thank you again for squeezing us in last weekend and for the excellent work! Everything looks great. Thank you again. The dogs love going into the yard. They’ve missed running outside like freaks barking their faces off. Thank you for being the professional you are and working with us. We are very pleased with the work and the follow ups you have provided. Just wanted to send you a quick email to let you know that the Board of Directors at Mowat is extremely happy with their new fence!!! Thank you for all the work you did on this project. It is greatly appreciated! the repair and to the guys who did a great job today. Thank you so much for lending us the fence for our school production of “Godspell”. Our school musical was a great success and your generosity added to that success! The fence has been dismantled and is sitting in the hallway close to our loading dock close to the back of the school. When could you arrange for pick up? Your guys are like ninja’s. They come and do something and you don’t even know they’ve been here. Kudos to the guys for enduring this weather. Thank you very much to you and your amazing staff for helping turn my backyard into the oasis I’ve been hoping for! I LOVE the new fence!!! Your staff are friendly, courteous and do amazing work with such attention and detail. I’ll be calling when it’s time for a new deck! I wanted to let you know that your guys finished the posts today. They did a great job, it looks nice and straight. They were also outstanding guys, very professional and very well-mannered and polite, very nice to see. I look forward to your fence installers being here on Wednesday/Thursday to complete the job. The fence looks great & I’m very happy. I want to thank Eric and the crew who did the work putting up our fence at the corner of our condominium. It has greatly stopped the flow of people traffic, bikes etc. from the street and bus stop that we were dealing with on a daily basis. Not only that, it looks great too! I have heard only good comments about it and feel that it adds to the look of our townhouse condominium setting. Eric was very helpful and knowledgeable about what type of fence would work best and kept in touch throughout a long delay while getting approval from the owners. Definitely have, “Peace of Mind” as the jingle goes!! Thanks for a job well done. The boys worked hard today and did a great job on a miserable day where they had to fight water filling the holes and the whole bit. Hopefully the posts all set properly tonight. Andrew and Rob were terrific representatives of Jay Fencing that’s for sure. Again, thanks for your help in expediting the completion of the fence. It is great!! Hank loves it! It has again been a pleasure to work with Jay Fencing! My first experience was several years ago at the Village by the Arboretum in Guelph, and my most recent has been at peopleCare’s Hilltop Manor in Cambridge. The fence is wonderful and looks great. I am so happy to have our privacy back. Thank you again for all your hard work and making this happen. Kelly, these guys are awesome. It’s 5:27 and they are still working. No time for lunch. All the posts will be in by the time they are done. I am so impressed!!!! They deserve to be recognized for their effort and work at my home today. We’re really happy with the way everything turned out. You were very accommodating and the guys were very professional-and we were impressed by their hard work, despite the weather. I’m sure you know that your guys are here to-day digging post holes manually in the snow. I am very impressed with their professionalism and the care they have taken with this side of the yard. Please thank them for me. just wanted to let you know, that the fence looks great! My wife and in-laws are very happy with the job that your team did with the install! Thank you very much for being patient and accommodating our time line. I will recommend Jay Fencing for any fencing job that my friends or family will do in the future. I want to thank you for the excellent job that was done. Thank you for giving me back my backyard. The fence looks great! Your guys did an awesome job. The guys that came to install the gate were awesome! The gate is great! Thanks for all your help and please pass on how awesome these guys are! My husband and myself are very pleased with the both the preparation and the installation of our fence. Eric Schroeder was an absolute fund of information. His experience and knowledge on the subject of fencing proved invaluable as we had some difficulty with our neighbour. He was professional at all times and responded promptly to all questions. Your company was recommended to us and we can certainly see why. The receptionist was very friendly and helpful when I called in. The 2 gentlemen who installed the posts were professional as were the subsequent 2 gentlemen who installed the fence proper. Thank you so much! Lisa. Again, I just want to tell you how happy I am with you and your installers work! Love the height and look of everything! I have gotten a lot of great feedback about how it great it looks and goes with the house! I sincerely appreciated the continued polite, easy-going and professionalism of the installers. And as I am OCD about cleaning up – again I never had to worry. Thank you for your above and beyond customer service! I do not say this often or at all to many of the service providers we have at our home to do work – but you guys were awesome. Thank you very much for sending me the written guarantee signed by Jay. I have to say our whole experience with Jay fencing has surpassed anything we have experienced before with any other fencing company we have used in KW. From sending Jay to our home to inspect the problem we were having to the work being carried out in a timely manner. You came the day you said you would, and finished up the day you said you would. We will definitely recommend Jay fencing to family and friends. Thank you again for great customer service and friendly smiles. I did not get a chance to send you a note about your Eric and Roger (the Friday install crew), (I hope have the names right! ), but they were fantastic! Honestly, I was so impressed with Eric’s (the crew lead) conscise and clear updates about the process. They were both very conscientious of keeping things clean (which is my favourite thing of all!!!) and letting me know when they ran into a problem (like rocks). Eric walked me through everything before they dug, during, and then again after to make sure that I was happy with their work. Honestly, I have had a lot of experience with terrible trades people, and they were top-notch! Please give them a big bonus and a turkey at Christmas! 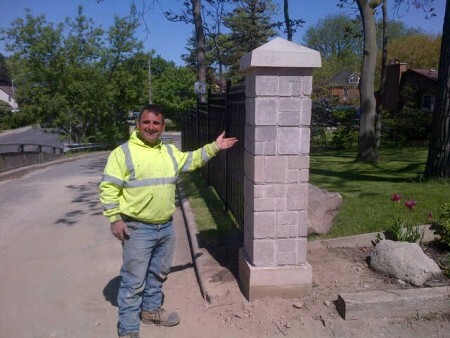 I just can not say enough good things, but I really appreciated Eric calling you to let me know about how the install of the gate was going to go down – just really impressed with what was genuine customer service. There was no going through the motions. They also worked their buns off! They never stopped moving! Awesome! Just awesome! Anyway, I hope they get the accolades they deserve. Between you and the workers – I am just so glad that I picked you guys to do the work! Amazing!! You have been timely with your communications, and so easy to talk to even if I had silly questions!! Hope you can pass on my greatest appreciation of you and your teams’ hard work!! The guys did an outstanding job on the weekend. I actually recommended you to a few of the agents we saw over the last few days. Larry and I would like to thank you and your crew for a job well done. We are very pleased with the fence and the gate. Each of your men on the crew were professional and very accommodating. We highly recommend your company. Hey just wanted to let you know I have been getting tons of compliments on the fence! Thanks again for the work. Glad we went with Jay Fencing, we can confidently refer anyone we know that’s interested in fencing to your company. You “guys” know great customer service! Thanks Sarah, Keri, and Natalie. We needed to install the fence so that our very energetic dog could run around in our specious back yard. I sent e-mail to JayFencing and was almost immediately contacted by Eric. We arranged for his visit; it was pouring rain when he came and spent good 20 min walking around our back yard, while I was watching him from the inside. Eric was very informative and professional but also extremely friendly. He explained to me why our original idea about where to put the fence was not going to work and he suggested a different approach, which we accepted. Two young and polite guys came several days later to install the poles, and a few days after that Eric called me at work to let me know that the job was completed. The whole procedure was easy and neat, without time being wasted. From the moment we contacted JeyFencing we felt like our job was in capable hands, and we were not mistaken – our fence is beautifully done. We recently had a fence built by your company and I felt that I had to write you directly. I called and got quotes from several different fencing companies and decided to go with Jay Fencing. Kelly was punctual, very competent, explained everything, answered my questions and what he didn’t know he found out for me as soon as possible. The other companies were ok, but even though they were a bit cheaper, I had to go with my gut feeling that Kelly and Jay Fencing were the best for us. I don’t know what the names of the people were that worked on putting in the fence posts and then later built the fence; all I can say is they were super hard workers, friendly, cleaned up after they finished their work and were polite. I cannot praise these guys and Kelly more highly. You really have a great bunch of guys working for you and you should be really proud of them. I especially appreciate that you sent your son to help with the fence posts and that everyone was aware of the situation with the neighbours and conducted themselves accordingly. Everyone, especially Kelly, went out of their way to make this fence happen quickly, neatly and beautifully. I really feel they all went above and beyond. I LOVE my fence and the gate. It is so wonderful to be able to go into my backyard to sit and have my tea in the morning outside without being afraid. Thank you so much for everything! You guys are my new heroes. Our front entrance looks FANTASTIC!!!! Thanks so much for all your hard work. 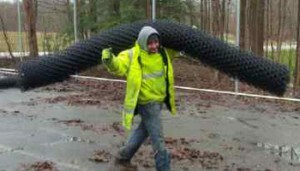 The guys on site were great & even posed for pictures. I may be having another project coming and I will be sure to call you again! We LOVE the fence. It is fabulous, and the dog is in sheer heaven booting around the yard. Your guys were so good – they obviously care about doing a great job, and they were polite and pleasant to have around. It is all great – just wanted to say thanks. Please tell the guys I said they did a wonderful job. Wow! What a fantastic fence you planned! We were absolutely thrilled with the new look in our backyard today when we came home today. Andrew and Mario worked very hard and were very meticulous, carefully using a level, and paying attention to every detail. We appreciated their great work! They rate five ( 5 ) * * * * * stars in our books. Thank you for designing and planning such a beautiful addition to our backyard! We are thrilled with the results. It is a superb job! Absolute pleasure working with Jay’s Fencing. From the quick scheduling of an in person estimate to the completion of the fence, all my needs were taken care of. Great service and quality! Your team finished up on Saturday afternoon. They did a great job, we’re very pleased. Thanks for the awesome work on the fence and particularly the gate. You were correct. It looks spectacular. My neighbour said he was pleased too and commented how professional it was. Take care and once again thank you. It was a pleasure. I was VERY happy to come home to my new fence today! I had guests coming for dinner and was extremely happy that the yard was not only transformed but left all cleaned and tidy. I was able to serve dinner poolside ….with total privacy. Despite my earlier reservations…you all came through with all your promises in record timing. Thank you. Thanks again. I was hoping for the fence to be finished by the weekend and it’s only Tuesday. You’ve made me another happy Jay’s Fencing customer. It’s really nice that even though you have become a big name locally, that Jay himself still listens to the concerns of his customers and stands behind promises of service. It’s no wonder your company has such an impeccable reputation and is so successful. It was a pleasure working with yourself as well as all your knowledgeable and skilled staff. I look forward to working with you again in the future. Just got back from a few business trips. The pool fence looks great! Good job by your team. Thanks again for the good quality job. Much appreciated and especially, the timing. I am very happy with the experience and quality of Jay Fencing. This is the second time I have called on behalf of our company due to fencing issues. I called one day and Eric the salesman came out, looked at the damage, quoted and confirmed the go ahead for the next day! The crew was on site the next morning fixing the fence and the work was done with expertise! Great job guys… will always call Jay fencing for their quick and speedy service! Good job and keep up the good work! Happy New Year to you and Father Jay. 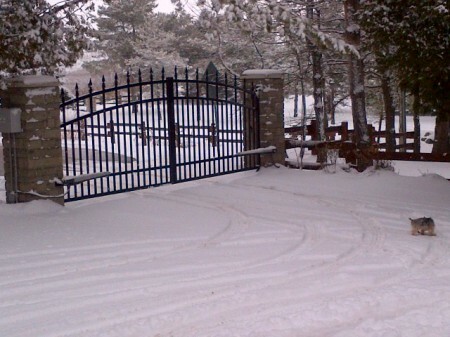 I love my gates – they work great. All is good. I wanted to take the opportunity to say thank-you for a job well-done! From your onsite visit through to completion and even beyond, you and your crew have taken the time to listen to my needs and resolve any concerns. Many friends and neighbours have commented on how amazing the fence looks. It is great to now have an enclosed area that my kids and dog can run free. The fence and gate look awesome! The guys did a great job on it. Thank you for fitting me in to get it done so quickly! Just wanted to let you know that Jon and I are very pleased with the work your company did. The deck looks awesome and the guys left the work site spotless. They have such a great work ethic! Thanks for everything. We’ll be sure to recommend Jay Fencing to our friends and family. We love the fence, especially the rear gate which is making our lives much easier already! Everything came up great, and your guys were excellent. The fence looks great! The guys did a fantastic job! The fence looks great, good job! I will definitely recommend you guys on quality work. The fence looks great the guys did excellent work. Thanks for everything. The fence looks great. We pulled the hedge out and it is exactly what we were looking for. I just wanted to write a quick note to express my sincere gratitude to Eric and Bugzy for all their hard work. I recently had a beautiful wrought iron fence installed at my residence in Waterloo and couldn’t be happier with the service and actual product. Eric was so patient and approachable during the planning stages and was very thorough regarding the logistics of the installation. He most definitely eased any and all of my concerns and I felt the price charged was quite reasonable. As for the installation, Bugzy was very friendly and explained my survey and walked through any and all questions with me. The entire installation team did a fantastic job and now my corner lot home is the admiration of the entire neighbourhood. Thanks Eric and Bugzy. My husband and I wanted to thank Jay Fencing for the wonderful job they did with our backyard fence. Eric promised us a great fence that we would be happy with and that’s exactly what we got. Right from day 1 their correspondence has always been professional and they also completed the job before we moved into the house as they promised. All is well with the fence and gate height and all seems to be well after some extensive tests. We would like to thank you for your professionalism and we would recommend you or Jay fencing to anyone in the future. We are very pleased with the fence. Our dog is so happy to run freely around the yard! I would like to thank you for your wonderful customer service. You made everything so easy and I felt confident that the job would be done well. I will recommend Jay’s Fencing to my family and friends. An excellent job in Woodstock we are very pleased. Please plan on doing Kitchener ASAP. It is a pleasure dealing with companies who take pride in their work. Amazing. We love it. Can’t wait for weather to co-operate to put furniture out back. We would highly recommend Jay Fencing to anyone that wants a fabulous fence. The guys worked long hours in the rain and mud to finish our fence was done in record time. We can’t say enough about Jay Fencing. Thank you again for getting your workmen to my place so quickly to build my deck. It looks great and I am so pleased with their work and your cooperation and consideration of my budget. With thanks for a fine job done on my gates and chain-link fence, and compliments to the very nice and respectful crew of two you sent. I’ll be happy to recommend your company to my friends and neighbours. To all of you who helped put up our beautiful fence! THANK YOU very much! We love it! It was a lot of work and crazy weather. Hope you know I appreciate what you’ve done. Hi Dave. We are thrilled with the fence!!! Fantastic workmanship and exactly as we described the fence to you through the pictures!! Again great job! I would also like to mention that the young man (blonde ponytail) was extremely polite to my wife and so beyond being a good workman, he was also a good representative for your company. Should also point out that we are very fussy people (particularly Karen) so we don’t pass along compliments easily and unless well earned. I doubt you need it but, if you need any references for how good your work is, please feel free to use us in that regard. Your company would get nothing but the best recommendation from us as to customer satisfaction. Thanks again. Hi Kelly, Yes, we are very impressed with the work. Please pass along our thanks to everyone involved. We are satisfied with everything. It was a pleasure dealing with you on this and I will certainly recommend you to anyone I hear that needs fencing. The service was very fast and pleasant. The sales person (Eric) was very professional and friendly individual to deal with, I would definitely recommend Jay Fencing. We are very pleased with our fence and find our back yard is now our little oasis. Our experience with your company started with a thorough estimate and then follow through on the date of the post digging and fence building. On the day of the fence build, we were fully consulted on what we wanted and were offerred suggestions on what might look best. We had a minor issue with a neighbouring fence but that problem was quickly overcome with a solution that made sense. The last part of the job was the gate and it was a complete Wow as an arch was created that was both stylish and functional. We are very pleased with the job done and would recommend Jan Fencing to others. I bought a new house which meant work – the fence was a disaster! When I came home from work the day it was finished I stood there with tears in my eyes. The transformation was incredible and I couldn’t get a word out. The fence was perfect, but the gate was the miracle. The team doing my fence had created a masterpiece in wood. I never expected it to be THAT good! Thank you so much to everyone who worked on the fence. I am one VERY happy customer! Kelly, Sarah, we are absolutely thrilled with the work done on the fence at 111 Duke, and can’t thank you enough. In fact I can’t figure out how you did it, because as closely as I look, I can’t see the join. As a charitable agency, which survives on the strength of community donations, your help in this way enables us to continue the work we do for more than 350 child victims referred to us each year. We’ll be sure to mention the work done in our next newsletter, which goes out to a thousand people…and on our website, which gets 13,000 hits each year. And I’ll let our board and staff know who to call when they need a new fence!!! I wanted to send you an email to let you know what an amazing job Dave and your team at Jay Fencing did with my fence project. From the start Dave showed professionalism and competence far and beyond his competitors. We paid quite a bit more to go with Dave and have to say it was worth every penny. The whole Jay Fencing experience was painless. From the guys digging the holes to the guys putting up the fencing everyone displayed a high level of knowledge and courtesy. I think exemplary service should always be acknowledged and celebrated and I will not hesitate to recommend Jay fencing. Thanks for sending the guys over so promptly. Fence is great. Would definitely go with Jay Fencing again and if we move (as we would like to), we will. Hector. yeah all is good. We had a great time in the sun at the cottage this past weekend. Your guys did a great job. Jay Fencing exceeded our expectations. Thanks for your assistance when it mattered! Hey Kelly…the fence is done! I absolutely love it! Thanks so much for everything! Please send my thank you’s to Samir and the others! We had our fence installed by a competitor of Jay Fencing less than 2 years ago. A large section came apart from the corner post and the competitor did not honor their warranty. The competitors Customer Service and Workmanship was very disappointing. No one even came to see the problem we had. We called Jay Fencing to see what it would cost to fix the fence that wasn’t even built by them. We spoke to Natalie at Jay Fencing and she sent someone out the same day to see what the problem was and called us back as promised. When we asked Jay Fencing what it would cost to repair the fence they replied “No charge” and we’ll have someone there in the next day or two. What a surprise to come home the next day and see that Jay Fencing had been there and repaired their competitors poor workmanship for us at no charge. A huge thank you to Jay Fencing’s Customer Service Department and Fencing Crew for a job well done and appreciated. We would highly recommend Jay Fencing to all who are looking for quality and great customer service in their fencing needs. The boys already fixed the fence today and we are REALLY HAPPY! I am unsure who I would send this particular email to so I would appreciate you forwarding it to the appropriate people at Jay Fencing. The two gentlemen that dug and set the posts at my house today were incredible. They were personable (explained the entire process and clarified any questions they had regarding the work to be done), were efficient, went above and beyond to ensure the jobsite received minimal damage and left my yard in better shape then they found it. Jay Fencing is lucky to have these two guys working for them. Samantha and I are very excited to see the sections installed along with the gate! Thank you for getting us on the to do list so quickly. I really appreciate it!! Have you ever seen a more beautiful fence. Thanks to you and your crew, for a job well done. Just a short note to say how very pleased we are with Jay Fencing. The final product and the entire experience far exceeded our expectations. 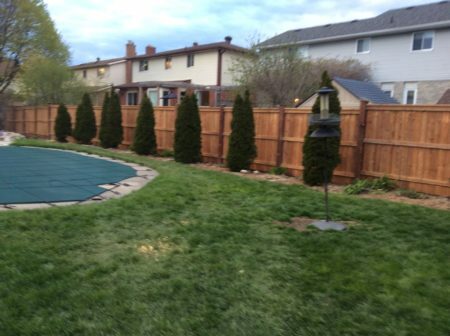 We are new to Waterloo and when we mentioned to a long-time friend and resident that we planned to upgrade our fencing, Jay Fencing was her first recommendation. We are so gald we took her advice! Your recommendations in terms of style and structure were spot on and will ensure the great look will endure for many years to come. Your installation staff were polite, considerate, expedient, skilled and professional at all times. We even learned two new techniques for building a quicker, cleaner and stronger fence! It was obvious they really knew what they were doing!! We especially appreciated that you were instantly and immediately available by phone and that you took the initiate and time for site visits before, during, and after installation. We will certainly be happy to recommend Jay Fencing with complete confidence!!! Just a short note in appreciation for a job well done by all of the crews and the people on them. Starting with first of all having met and talked to Eric Schroeder, having listened to his input and advice and explaining the problems we may indeed face in erecting a privacy fence. He was both positive and helpful with ideas and advice, committed to also being able to finish the project in a very close and tight, time frame for us, and in fact even showed up with the first crew on the first day, and assured me that there would indeed be no problems of any kind and if there were, to contact him immediately, and especially so in completing the job within the particular time frame. Eric in fact returned again and spoke with me and checked out the ongoing progress and again assured me that completion would be imminent and in a few days. Even the crews were understanding, professional in every way, and open to discussion and explanation as to the work being done and each following step. In fact each crew, as they finished for the day, reminded me that they needed to clean up after themselves, to the point where it would seem as though they were never there and proceeded to do exactly that regardless of the work or extra time that it took. Each of the crews, from digging and installing the posts, was meticulous in exact measurements and installing the posts as well as putting up the fence, building and installing the gate and finishing off the posts with a cap. The completed fence looks fantastic, perfectly straight and I am sure the envy of the entire neighbourhood and in fact have already had a neighbour talk with Eric and will likely at a later date, continue our fence on and across his own yard. We are so proud and pleased with our fence and with the entire project and job that was handled entirely by your staff and crews and would continue to suggest to anyone needing or wanting a fence to contact you and especially Eric. Our thanks for a very timely and professional job and special thanks to Eric, his expert help and diligence throughout, as well as the crews that were involved in the finished product and project. I was very impressed with the service we received from Eric Schroeder at Jay Fencing. He was extremely co-operative and in sympathy with our situation which was that some teenagers knocked down the fence of our preschool for special needs children. He gave us a very fair price for the work. I was most impressed that he completed the work the next day after he gave us the estimate. I will be glad to recommend Jay Fencing to anyone needing fencing services. Yes it has…and it looks amazing!! We are so impressed with the workmanship and the final product!! We are so very thankful and grateful for what Jay Fencing has done for us, THANK YOU!!! We just had Jay Fencing install an ornamental iron fence. We were delighted with our experience right from the start of the transaction to completion. Installers were very efficient and exacting to ensure fence was installed to our satisfaction. Although Jay’s pricing was slightly higher, we got a quality job that exceeded our expections. We would highly recommend Jay Fencing. Kelly! It’s 5pm and your guys are still here. Do you realize they’ve put in more work in 1 day then the pool guys do in a single week 🙂 Things are looking good. Fence sections all up and nearly done, alot of the ornamental fence is done, looks nice and sharp. Great job! Thanks – the experience has been great and the fence looks fantastic. The guys that were here Thursday and today were both great – very professional and did a super job. My husband and I are both extremely pleased with the fence we just had put in. Eric came to our house to give the estimate: he was extremely professional, competent and friendly. He made the whole experience painless, which is sometimes a rarity in the customer service world these days. The installers did a wonderful job; extremely professional workmanship. Even the staff at the office who I spoke with to pay the invoice etc. were wonderful. We will recommend your services to anyone we know of who needs a fence. Thanks very much! I wanted to let you know how much I appreciate your office staff and Dave your salesman and Rob and his crew for the excellent job they did putting up my new fence. Your employees are to be commended for their compassion and understanding due to the emergency of having my fence replaced. So often the owner of the company is not made aware of the personal touch their employees apply to their everyday work and I just wanted to let you know how greatful I am and I will recommend your company to my family, neighbours, and friends. Carol and I want to thank you work crew for the excellent installation of our fence; the neighbors have commentented on how well it looks, especially the impressive gate. The workers were very efficient, friendly and open to any questions we had. We would happily recommend your company to anyone wishing to have a fence installed. Just a quick note of appreciation on a job well done. We would like to thank Eric, Jay as well as the great installation team for their super customer sevice and attention to detail on the installation of our new fence. We are very happy with the finished product and will not hesitate to call and/or refer your company for future projects. We are more than pleased with our new fence. The finished product looks tremendous and all of the crew members who helped complete the job were fantastic…especially Shane!!! When Tina and I decided to fence in the front yard for the dogs, Jay Fencing immediately came to mind as I constantly hear your advertisements on the radio on KIX106.7FM. I checked out your website and read all of the letters that your satisfied customers had submitted. Those letters convinced me that there was no need to call around and wait for countless estimates, I was only going to call Jay Fencing!!! From start to finish, everyone involved with this project gave 100% EXCELLENT CUSTOMER SERVICE which is something that is hard to find these days. So thank-you Sarah for a terrific experience, I will definitely recommend Jay Fencing to friends and family and would not hesitate to call again in the future if another project arises. P.S. Maggie, Cooper, and Rosie are also very happy with the fence!!! Thanks, Hector! And by the way, your team did a great job, we are very pleased with the results. Thanks. We are extremely pleased with our new fence and with the superior customer service, professionalism and sensitivity consistently demonstrated by everyone at Jay Fencing Ltd. Our job was completed within the time frame promised and estimate given. The final result exceeds our expectations in every way. Thanks to Eric for his patience, understanding, and suggestions on fencing in a difficult situation. Also thanks to Ryan and his team for the hole digging and post placement. Finally, thanks to Samir and team for his artful design and expert final installation. Great work everyone! We would not hesitate to recommend Jay Fencing Ltd. to anyone and/or hire you again in the future. They did an awesome job today. The digging was pretty tough going especially in that heat. And they left the site neater than when they started. Please let them know how much I appreciate their hard work! Tx. Thanks for the fence. It looks great. Eric was very helpful in picking out the fence and helping with ideas. 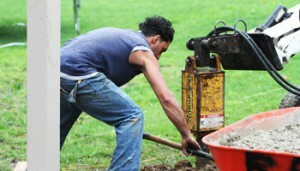 He worked quickly to get the fence in and made sure everything went smoothly and efficiently. The installers were super as well and made sure we were pleased before they went ahead with any changes. The obviously knew what they were doing. Thanks for a job well done. Thanks guys! I would like to take this opportunity to thank you all for the GREAT job done on my fencing. It is not only beautiful and well constructed but it fit right into my budget, too. I have received so many compliments that I would like to pass this on to you… “Well done”! I called a few companies, stopped in to speak with them, some came out to look at what had to be done. One fellow disregarded my request for a quote. Quotes for the same size fence using the same materials ranged from $2,800 to $5,100. Only one of these business people were prepared to show me some ideas of what was possible. To say that I found them unimaginative, poorly organized, disinterested and out of tough…is an understatement. I was looking for the impossible combination: expertise, imagination, trustworthiness, good quality materials and excellent workmanship. I found ALL of those with Jay Fencing!! I know that I was what one might easily describe as a “difficult customer”, I was slow at every turn, wasn’t really sure what I wanted (looking for suggestions), wasn’t sure what I wanted to really spend…changed my mind all too often…and through it all, not only did I not once sense any frustrations from you or your crew, but there was a thorough willingness to work with me, to make suggestions, to tell me what the better products would be for my project and my budget, and to help me see where some of my ideas would cause issues down the road. No corner cutting at my expense with your company. I felt that you were more than happy to work with me every step of the way. I cannot impart upon you what that meant to me, Dave. I would like to once again Thank You, you and your crew were extremely knowledgeable, professional and most importantly, patient. It was such a pleasure to work with a team of individuals who not only had the needed expertise but were all too happy to provide such a superb customer service!!! I will highly recommend Jay Fencing at every turn, it has been a pleasure working with you all. Please, feel free to use my name and or this letter as a reference anytime. p.s. I think that photos of my fence should be in your website…as it combined the metal topper and the wooden fencing and you haven’t got that on your site. My husband and I would like to thank everyone from Jay Fencing for their involvement with the installation of our ornamental iron fencing. 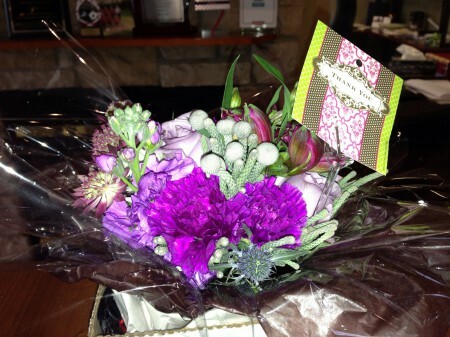 It is beautiful and we have received so many compliments that we would like to pass on to you and your employees well. Your employees were extremely knowledgeable, professional and most importantly, friendly. It was such a pleasure to work with a team of individuals who not only have the expertise but provide excellent customer service!!! Could you pass on a personal thank you to the following employees for their involvement with the installation of our fencing. Thanks again Eric Schroeder, Rob, Chester, Ryan, Cody, Keri and Sarah. Great Work!!!! We highly recommend Jay Fencing and it has been a pleasure working with you all. Please feel free to use our names as a reference anytime. It was a big surprise to see Jay himself come to my house in quick time to see my concerns and have them fixed in a jiffy without a word regardless of what I thought and he took the time to explain things. I will gladly recommend Jay Fencing to everyone. I’m still in shock how fast you guys jumped on this issue, I thank you once again. The deck is excellent! My wife and I enjoyed a nice steak dinner on the deck tonight and we are so happy with how it turned out. Everything is so great and we are so happy. I am glad Jay convinced me to only go with one step up to the octagon – much better than having two or three steps. Thank you so much for everything Sarah. We are so happy with the deck and are happy to refer Jay Fencing to our friends. 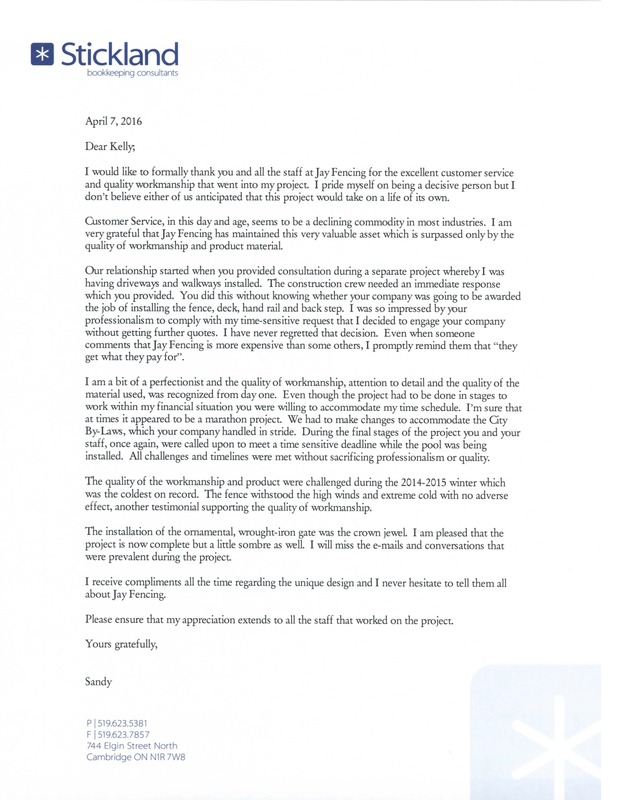 Bill and I thought we would share with you our experiences with your competition during the fence decision process, just for your information. We didn’t have any recommendations from anyone as to who to look at for a fence so we took to the Yellow pages. Initially Bill called “Company A” and they returned the call and scheduled an appointment. A lady came out and measured and advised we would hear in a day with a quote. We never heard back from her. We called the company after 3 days and were advised the quote would be delivered by telephone the next day. We have not heard back from them to this day. I then chose 3 fence companies from the Yellow Pages, “Company B”, “Company C” and Jay Fencing. The following are the results to my inquiries. No reply to my message from “Company B”. “Company C” told me to call another number, and the girl I spoke to asked where I lived. When I told her she said she had to have someone else call me back because she didn’t think they went to Puslinch because it was “too rocky”. I never heard back from them. I called Jay Fencing, spoke directly to Eric and set up an appointment for the next day. Bill then left another message with “Company B” and had a return call saying they would come the next evening and give us a quote. They never came. He then chose another company from the Yellow Pages, “Company D”. They came out immediately and gave us a quote, however we had already had our quote from Jay’s at this time and knew that we wanted the 20 year warranty product. He offered a competitive price and said he had a product with the same warranty. He presented us with a brochure for the product and it indicated that the warranty was only 5 years. When questioned on this he was going to investigate and get back to us. Never heard back from him about the product, only to see if we had made a decision. At that point we had spoken with Eric a few times with a few questions and a change of our plan and were met with an immediate response and we were sensing that we would get good service with Jay Fencing so we then made our decision. Bill and I both know that this is a very busy time of the year for all of the outdoor trades and expected to wait but we were extremely surprised at the lack of interest and response we received from these other companies. We feel it is quite shortsighted of them to ignore potential customers and that it is also extremely damaging to their reputations. It shows an absolute ignorance in customer relations. We don’t have any qualms about sharing our negative experiences with these companies as we were not given anything resembling customer service. Fortunately for us, we did make the phone call to the company that does care and here we sit…..very satisfied customers! Just a quick note to recap to you the comments I made to the girl I spoke with on the phone, when paying my bill. Bill and I were extremely impressed with every aspect of our dealings with Jay Fencing, from the very first phone call I made inquiring about a quote to the completion of the job. The customer service we received was exemplary. We were given a quote immediately, followed up by a timely schedule once we accepted. The young men that came to do the job were very polite and informative and eager to please. They also were very professional and skilled in the job they performed as well as demonstrating good work ethics. These young men represented your company so well as they arrived to do the job and focused on the job until its completion without wasting any time. I must say we were very impressed with them especially after seeing other trades that lacked their maturity. It was a pleasure to deal with all four of them. We were also pleased that every phone call or email was replied to immediately and that every thing that we were told, regarding time frames, actual dates etc. were absolutely true. At no time did we second guess our decision to deal with your company. And not to be forgotten, the fence is gorgeous, beautifully installed, and we couldn’t be happier with our choice. It will be our pleasure to recommend Jay Fencing (and already have) to anyone and everyone. just a note to let you know how pleased we are with our new fence and we wanted you to know how pleased we were with eric’s service and a special thank you to rob your installer for the great work. i would surely recommend your company. I can not thank you and your team enough for the great work you have done at my house. The stairs are amazing and the quality of work is great. Thank you again for getting them done so quickly it adds so much to my new home. We debated about doing the fence ourselves or having a company do it. When our neighbour had his done by Jay Fencing, we liked the quality and the workmanship we saw. As the two fences would join together, we decided to have Jay Fencing do the work so that the look would be more pleasing to the eye. Everyone from Dave in Sales to the installers were great to work with. Thanks for a job well done. I wanted to let you know that we found (Eric’s) approach and style to be most welcoming, genuine and helpful. In this day in age, with our unsettled economy, it is refreshing to talk to a company representative that is a true professional, honest and caring. Andrew and I both mentioned that we thought Eric provided us with “more than expected” service and we were truly appreciative. I too work in a service orientated environment and know that it is usual to only hear the negative which is why I wanted to send a little note. Jay – You’ve got a great employee in Eric and we look forward to working with you. Just a brief “e” to extend my sincere thanks and time that Eric Schroeder extended to me recently. We have a fence that requires a “small” repair and as I went thru the telephone book I saw your ad. Eric was professional, timely and most importantly, completely honest with his assessment of the situation. He literally saved us hundreds of dollars with his complete professionalism regarding the project. It is rare in this day and age to meet someone who has the strong values and morals that Eric has. I appreciated meeting him and was completely satisfied with his recommendations. Jay Fencing has a very valuable sales/estimator in Eric. The English oak split gate that you installed at the end of the lane to our heritage property is absolutely a work of art. We are so pleased with it and proud of it. It enhances immeasurably the entrance to the property. Even though it has only been installed a short while we have received a great many compliments on it. We want to extend our thanks to Dave Dey for arranging Chris and his partner to come and repair our gate problem on May 31/08. Hopefully the ground has settled now and we won’t have this issue next spring. Again, we appreciate your help Dave, and the excellent service from the crew! Please don’t hesitate to stop by again should you be in the area. Regards, John & Christine Brown, Elmira, On. This is the second fence we have had built by Jay Fencing, and both times have been excellent quality. The fence is exactly what we wanted, and built in a reasonable amount of time. Just wanted to express our thanks for the professionalism shown to us in our recent fence installation. Your phone calls advising us of the status of the installation were very much appreciated. It’s getting harder and harder to find great customer service and we’re happy it’s alive and well at Jay Fencing. The fence looks great and Hunter thanks you as well. Take care Kelly! Graham and I would like to say thank you to Eric and his wonderful team that came and built our fence. It looks amazing! You all worked so hard at every detail. We can truly say we have the best looking and most well built fence in the neighborhood! We are looking into having a deck installed next summer – you guys will definitely be first on our list! Thank you for the fantastic job. I was delighted to find the fence erected when I returned from a weekend away. Eric was extremely knowledgable and helpful. Communication with Eric and the company was easy and quick. I will recommend Jay Fencing to anyone who may require your services. The job is perfect. Thanks for all your help with the project. I will be recommending that we only use Jay Fencing from now on with all of our projects. This was a very small job for us and I look forward to working with your company on some nice, large projects. We recently hired Jay Fencing to install fencing along our back lot line, which borders onto a wetland area. Eric’s initial consultation/estimate included very detailed information and practical recommendations. The teams that completed the work arrived as promised and finished the job in a timely fashion. I would recommend Jay Fencing to anyone looking for quality work, at a fair price. I just wanted you to know my mom really likes the porch vinyl railings you installed. Your idea of changing the side railing for an easy grip is a good one which she appreciates alot. Thanks so much for your help with this Kelly – your regular communication has been very helpful through this process – and the fence and deck look great – thank you! It looks excellent! All around great job! Great job guys, exactly what we wanted, and very professional. Not one hassle or complaint. Thanks for your help and support. The guys did an amazing job and in crazy extreme weather. We are very very happy we went with Jay Fencing. Talk to you later and in case I don’t notice the side gate, just send me an email when it is installed. We are very happy with the end result of the fence and deck; the final inspection by the township was finally done sometime in September with no problems (in fact he was here about 10 minutes at the most, took a quick look and that was it). Even though there’s snow all around it now, we’re glad it will be all ready to go in the spring. Thanks again for all your expert assistance and advice. May 20, 2008 I would like to take this time to sincerely thank you for a fantastic fence that I will enjoy for many years to come. I live on a corner lot and the fence gives much more added character to the house. I am very very pleased with choosing Jay Fencing as I was unsure at the time on what company to choose within the tri-cities area. I heard very good things prior to the fence going up regarding companies, advising me that I was choosing the right company for the job. Two of the agencies doing locates advised me that Jay fencing was also one of the only companies doing locates for customers and that I made a good decision on my choice of fence companies. I felt at ease knowing that this company was taking the time to ensure the customer that they are professional, prepared and have great knowledge with their expertise. Their are many companies/contractors in this day and age that do not pride themselves on workmanship, professional courtesy, customer service, and clean up at the end of a job. Jay Fencing more than met all my expectations of a tremendous job well done, the workers greeted me on site and asked me time and time again if everything was okay and how I wanted it, again reassuring me that they were there for me. I made a few changes and alterations also when fence posts were already in and they replaced posts to my liking no questions asked, reassuring me once again that they were there for me, and my needs came first. Jay Fencing prides itself on their workmanship, professional courtesy, and customer service. I also found their pricing to be one of the best out there as I also got three different prices on exact fence estimates. A special thank you to Jay and Hector who worked close with me in accomodating me with this project. In answering anyone’s questions about a fence, your special project is their special project, and if you choose Jay Fencing at the end of the job I most guarantee you that you have chosen the right company for the job. Thanks once again for an excellent experience and a job done that far exceeded my expectations….